Hey everyone! We hope you all had a wonderful Christmas, Hannukah, holiday season and a Happy New Year!! We are both very saddened by the deaths of both David Bowie and Alan Rickman 😦 We will miss their wonderful talents very much. In other news, Katy’s husband got a great new job!!! You can visit his company’s website below and even purchase items!!! So again, this year we will be having a Downton Abbey contest! At the end of Season 6, even the Christmas Special, we will cook up an extra hard trivia question! We will put a link in the show notes to Rafflecopter. Once everyone has answered we will draw from the pool of winners who answered the question correctly for prizes. So far we have a ‘Behind the Scenes of Downton Abbey’ coffee table book, donated by Katy; a Downton Abbey sock sack donated by KnittyKat Bags; and a skien of ‘Shrewd Lady Mary’ donated by One Twisted Tree. We’re waiting on a couple other emails so hopefully there should be more prizes too. We hope everyone is enjoying the last season! Katy finished her ‘Socks on a Plane’ by Laura Linneman using Desert Vista Dyeworks sock yarn in ‘Mint Cocoa Quilt’ just in time for Christmas! She also finished her ‘The Bee Keeper’ cross stitch by The Frosted Pumpkin Stitchery and all she needs to do is frame it. As for Ho’s she has one Rose City Roller sock done using ‘Extra Pink Roller Rink’ by Peepaloo Fields on Etsy. Needs: Val needs a new car! Katy needs to put her Christmas decorations away! Wants: Katy wants a new iPhone. Val didn’t know what she wanted as she was happy with how things were at the time of recording. Want to do: Both Val and Katy want to go and see Labyrinth in the theatre! Learned: Katy learned she is much stronger than she thought she was. Val learned she is also much stronger that she thought she was. 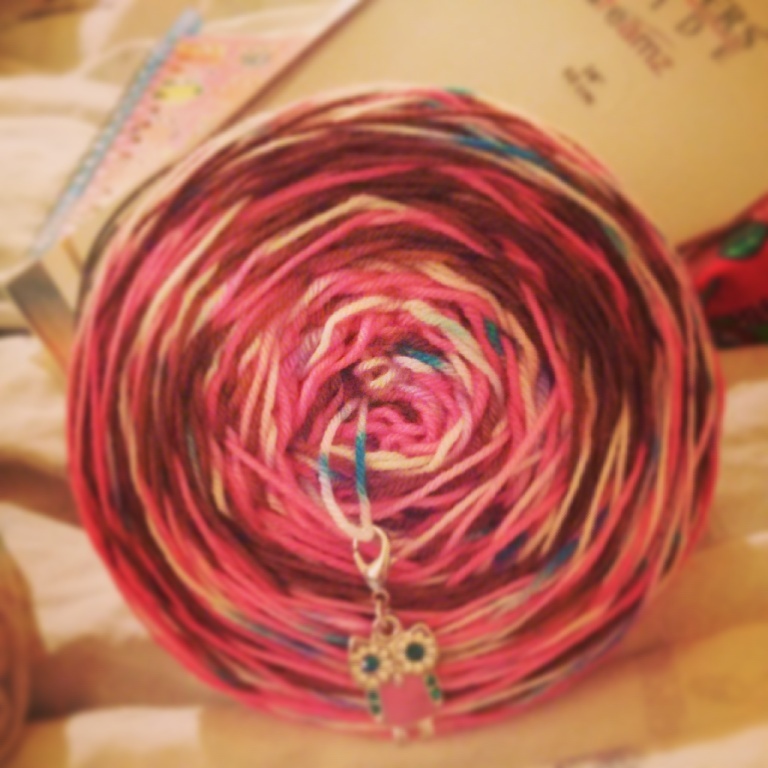 Katy was had at yarn… bowl! She found Barruntando Ceramica on etsy where you can find pottery made from honey! There’s some great yarn bowls in the shape of bats, baby sloths, foxes and ones with rain clouds and hearts carved out of them! We both got some pretty cool stuff for Christmas! Val got herself a small android tablet and she’s loving it! She also got a Sherlock funko pop figure (the one with the violin), she got some Red Heart Boutique Swanky yarn and it’s a really nice deep black and it has oblong sequins throughout! It’s going to be very nice knit up! She also got some really pretty handspun from Katy for Christmas – it was Ashford merino/silk and she spun it into a true 3 ply yarn. Katy got some pretty Red Heart Boutique Swanky from Val and it’s a gorgeous bright fuscia colourway! She wants to knit it up into a nice cowl for springtime. She also got 2 balls of KnitPicks Felici in ‘Countess’ from her friend Kelly and her mom made her a pair of ‘Jane’s Barathea Mitts’ from Jane Austen Knits Fall 2015 out of some stashed Rowan Felted Tweed. Katy also got some new earbuds and season 2 and 3 of Homeland with a gift card that Val had given her! She also did an order to Jetpens and got a Hi-Tec C Coleto pen to go with her planner. Reading: Katy is reading Clockwork Prince by Cassandra Clare, she finally finished Clockwork Angel. Val is reading the Fifty Shades of Grey series (for “research”). Watching: Both Val and Katy are watching Downton Abbey and Sherlock The Abominable Bride. Katy’s watching Limitless, WWE and the 2nd season of Homeland. Val is watching Outlander on Shomi and the 3rd season of Hemlock Grove on Netflix. « Episode 30 – Christmas is Coming!